J.M. Barrie’s 1920 science fictional story “MARY ROSE” about a young woman who disappears for weeks; then years but returns without memory or noticeable aging anteceded the ‘captured by aliens’ story vehicle by at least a half-century. Given the playwright’s recurrent theme of agelessness resulting from so many deaths of those with whom he developed close relationships, it is easily comprehensible that defeating the ‘grim Reaper’ might reflect a personal albeit impossible dream. 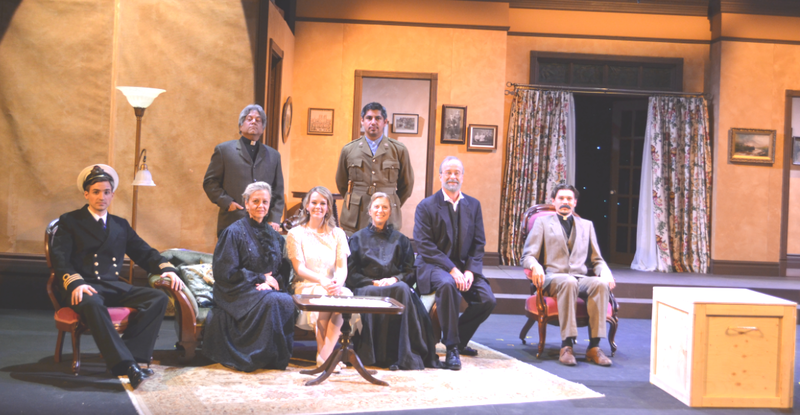 The play is presented in a contemporary (circa 1920) return of a soldier planning to buy an old house that embraces something ethereal. Through 30-year scene flashbacks the audience meets a naïve Mary Rose and her parents, as a friend/suitor requests permission to propose. The prospective husband is told that the daughter had once disappeared from a Hebrides Island for a curiously unanswerable three week period. The husband receives British Naval promotions; Mary Rose has a son; and the couple return to the mysterious island only to have Mary Rose again disappear. What has the local fisherman/boatman know; does the local rowan tree have magical powers; does the eerie sounds or odd lighting represent impeding misadventure… ‘Enquiring minds want to know.’ Far be it from this scribe to post a spoiler! If one believes in reincarnation, the title character has returned as director. The Oakville Players have selected Oakvillian & TOP stalwart ‘Mary Rose’ to oversee the staging of this supernatural tale with all its demands on character definition and special effects. Ms. Rose has recruited an octet of talented community actors to portray the ‘usual suspects’; a secretive landlady; parents with divergent interpretive powers; a Mr. Interlocutor friend; a surprisingly astute local minion and the love-interest couple. The title character is played by Andrea Kerswill and she brings all the charm and ingenuousness that her Mary Rose incorporates. Her expressions of pleasure and easy smile epitomize the inherent Wendy-ness that is recurrent in Barrie plots. Her naval partner Simon is Brandon Piereder and while there is little vibe between the two, they do act of each other albeit with some over-talks and miscues. The parents are Greg Proctor & Inese Hill and these two exhibit true marital chemistry. The latter can do more with her expressive facial expressions or her noisy knitting needles than many thespians with tons of dialogue. The accent and role interpretation of local crofter and budding theologian Mr. Cameron by Harris Bailey lets him steal every scene especially his Act 3 first scene that necessitates his demonstrating unexpected maturity. The landlady role is understated but determined by Valerie King, and Armand Antony endeavors to capture the angst of a grown-up ‘Harry’, the telegraphed son of the play’s protagonist. The Act # finale scene between him and Mary Rose is extremely challenging for the most experienced thespian talents. Both portrayers give it their best effort. The lighting; set props etc. are detailed and like the meticulous costuming, all enhance both mood, time and situation. Even the anthropomorphic tree contributes! Unfortunately, MARY ROSE is only at the Oakville Centre until Sunday Nov. 22nd. It’s worth seeing; pondering about and enjoying.